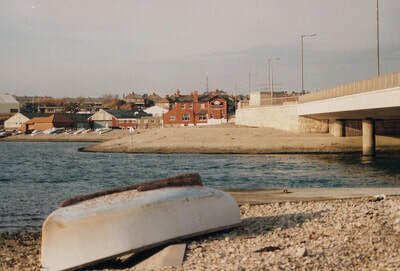 Ferry Bridge is a strip of land, joined by a bridge, marking the beginning of the causeway to Portland, positioned south of Wyke Regis village. 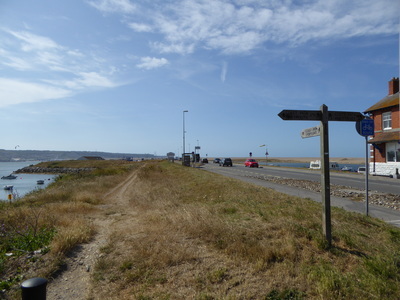 The A354 road passes from Wyke Regis across Ferry Bridge to Portland and is the only road connecting the island to the mainland. 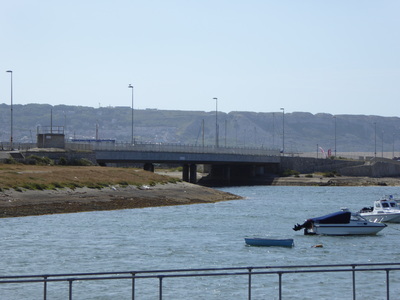 Ferry Bridge is also the point where the Fleet Lagoon joins Portland Harbour to the east via a narrow channel under the bridge. Overlooking the harbour side is Smallmouth Beach. 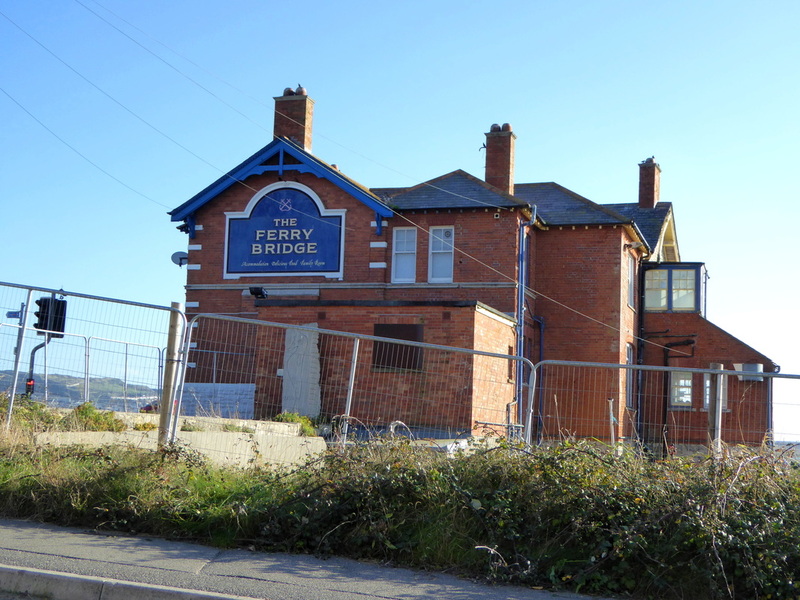 The last building on the mainland before the beginning of the causeway is the former pub The Ferry Bridge, which was once known as the Royal Victoria Inn/Hotel. 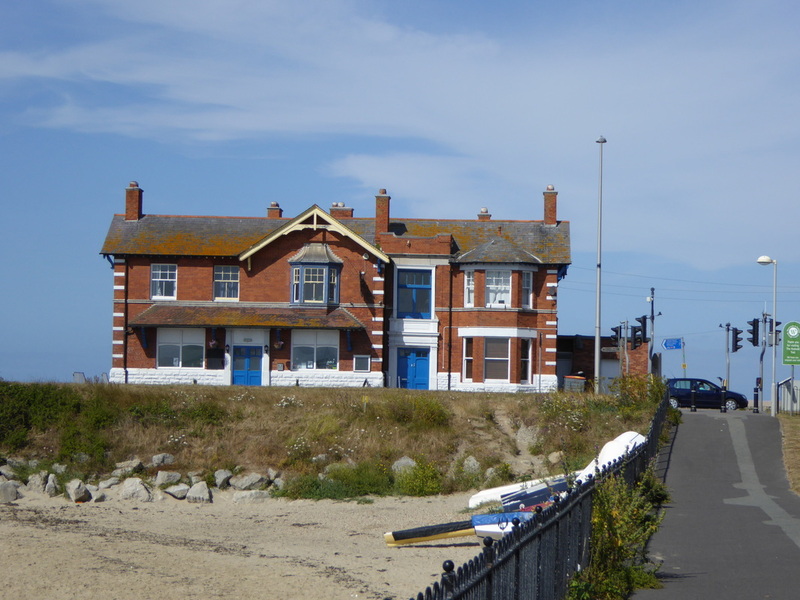 It was established as early as the mid-19th century, and was re-built around the 1890s. 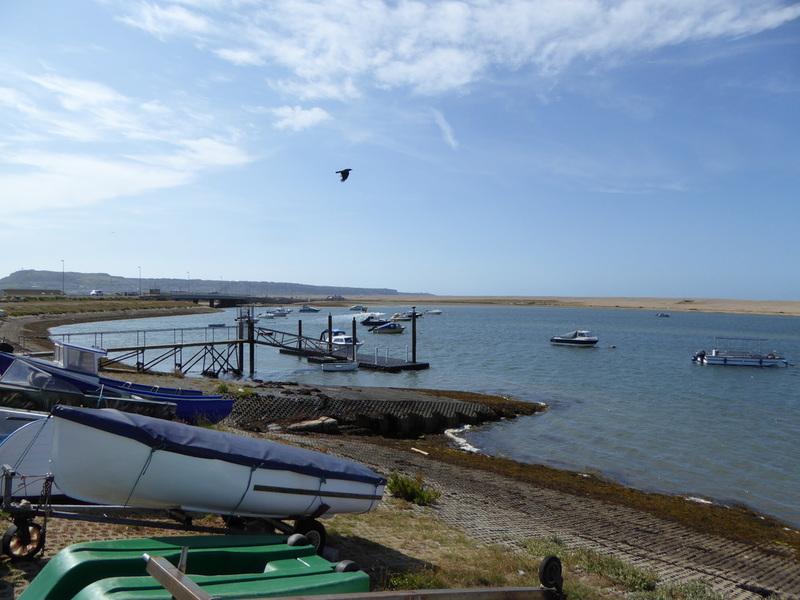 The first development on the causeway is Ferrybridge Marine Ltd's boatyard, with the Chesil Beach Centre also found further south. 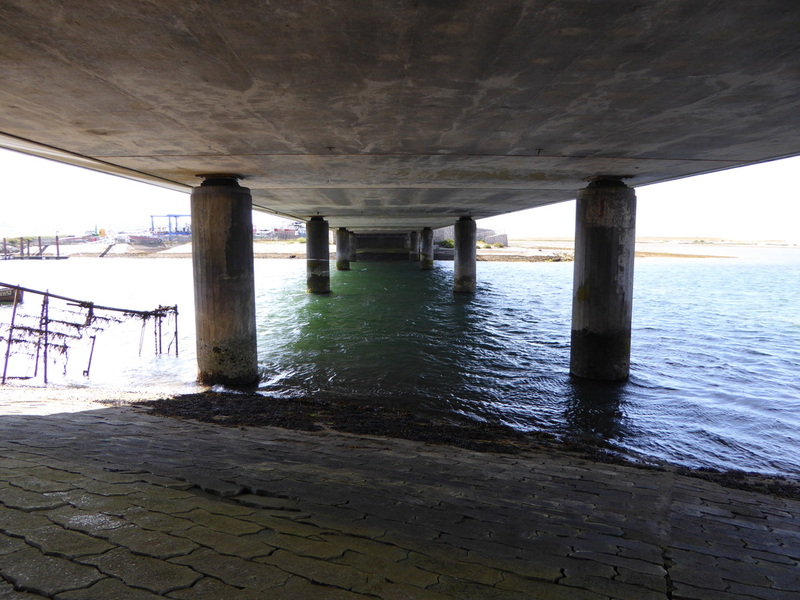 A boom has been installed at Ferry Bridge to minimise the impact of any potential oil pollution from Portland Harbour. 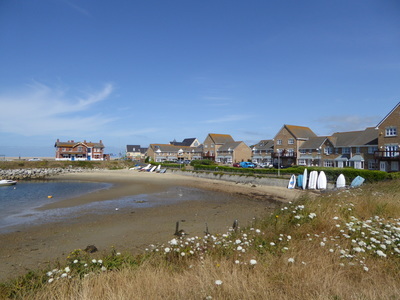 The western region of the harbour, which faces the causeway, is a popular location for watersports due to its exposure to south-westerly winds. Before the construction of the first bridge in 1839, the only connection between the Royal Manor of Portland and mainland England was Chesil Beach. Traditionally, very few Portlanders had the need or desire to leave the island and travel to Weymouth or beyond. The crossing at Ferry Bridge was originally served by a ferry which used ropes to traverse across the gap. At low tide, a sand bar was exposed enough to allow people to walk across it. The short crossing navigated by the ferry was always hazardous due to the strong currents of the Smallmouth Passage. In November 1824, a vicious storm which became infamously known as the "Great Storm of 1824", caused major destruction at the passage. 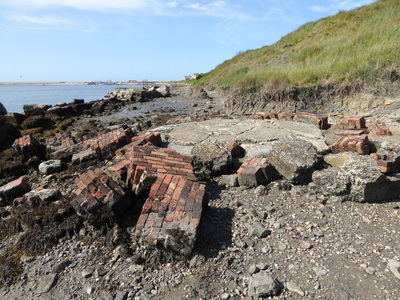 Both the ferry house and a passenger shelter were destroyed, and the experienced ferryman Richard Best lost his life when attempting to save a horse trapped in the passage. 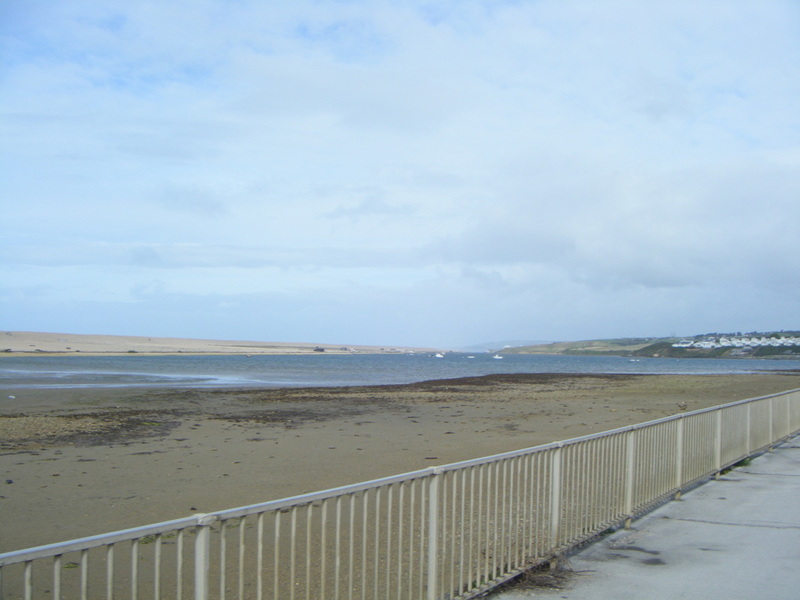 In addition, the sand bar was largely destroyed and the high water level at Ferry Bridge was left five times its former distance across. As a result, the passage was now considerably more unsafe and dangerous than it had been before. Since the late 18th century, petitioners had been calling for a bridge to be built at Smallmouth. Although these early petitions were unsuccessful, the 1824 storm greatly increased supporters' arguments for the construction of one. 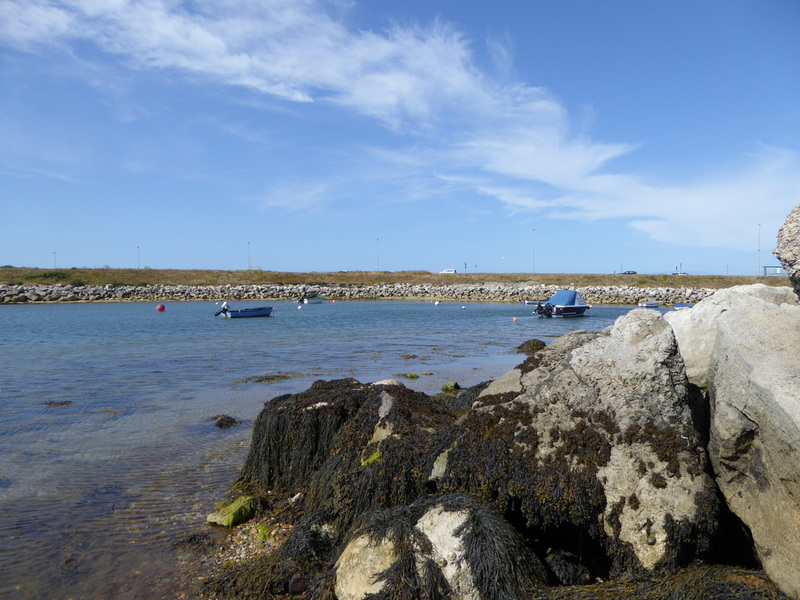 A Committee was soon appointed to bring the idea to fruition and an Act of Parliament was passed in July 1835 for "making and maintaining a bridge over the river called The Portland Ferry, in the County of Dorset, with proper approaches thereto". 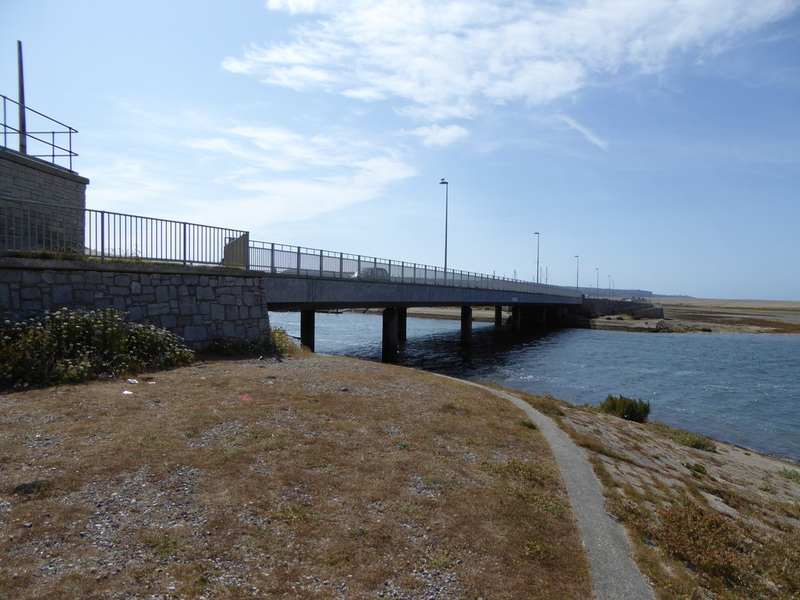 The bridge, built in 1838-39, was opened in the presence of a "grand and imposing procession" on 30 January 1839, which included a detachment of the cavalry regiment 6th Dragoon Guards and the Weymouth Town Band. A wooden structure costing around £6,500 to build, George Buck was the engineer and architect. As the bridge was constructed and maintained by the Bridge Commissioners, tolls were charged for its use. With the completion of the bridge, Ferry Bridge became something of a popular attraction for locals and visitors. 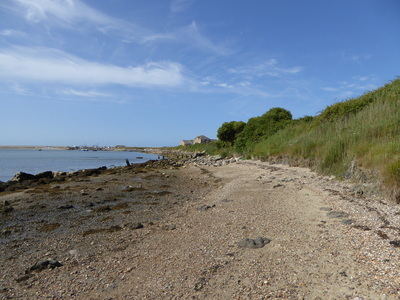 In August 1842, Smallmouth Beach was described as being "much resorted to by visitors" and that the "fine extent of firm sands cannot be equalled on the Western coast". Despite the construction of the bridge, some "humbler classes of inhabitants" often chose to use the remaining sand bar to cross the passage as it was seen as being more "pleasant and expeditious than the coach road". Under the 1850 Portland Breakwater Act, which saw £4,000 put towards the bridge's upkeep, tolls were able to be reduced, with further reductions following in the 1870s. By the late 1880s, the bridge was in need of major restoration or replacement. 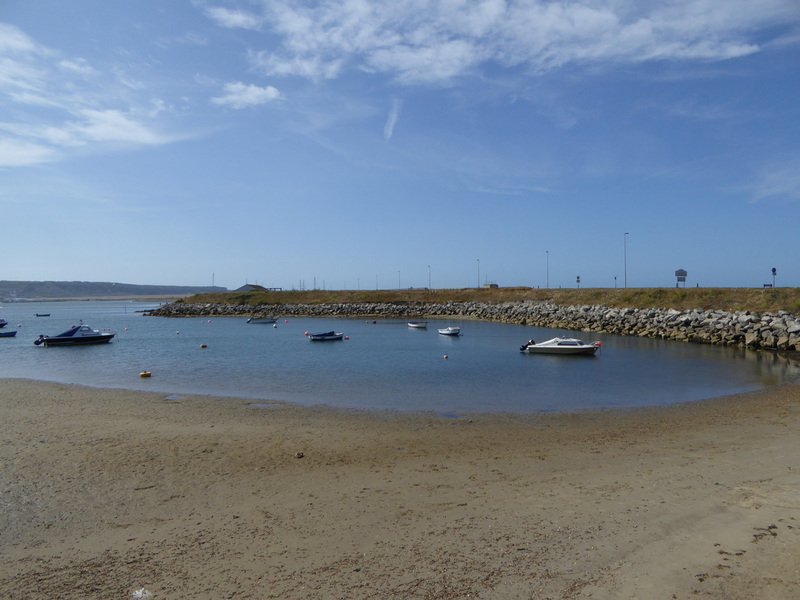 Plans for a new bridge, to be made of iron, were drawn up for the Ferry Bridge Commissioners by Sir John Coode, who had been the resident engineer and later Engineer-in-Chief for the breakwaters of Portland Harbour. 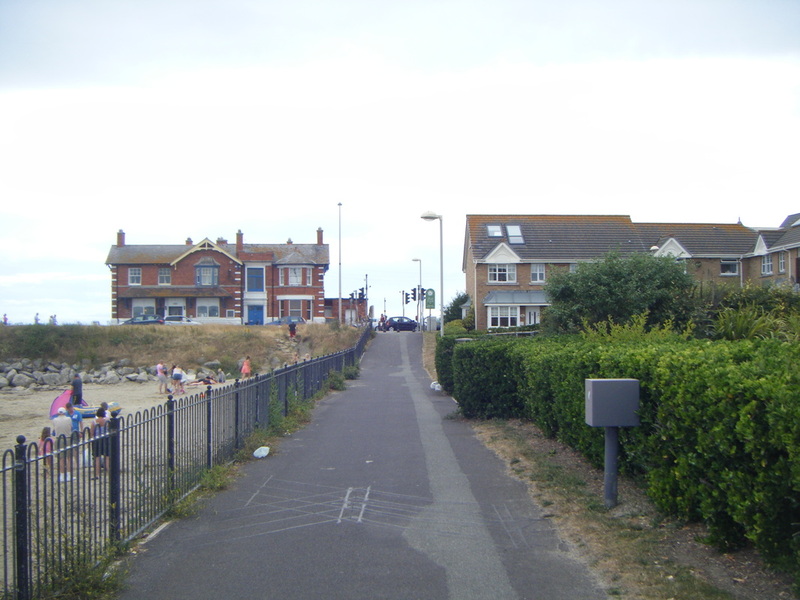 However, as the Commissioners were unable to raise the estimated £6,000-£9,000 cost, the plans had to be dropped. 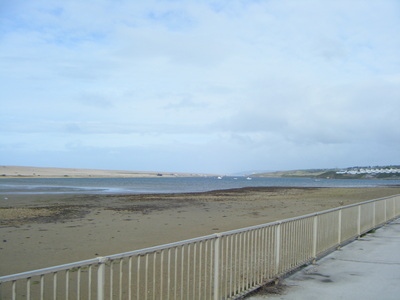 During 1889, the Commissioners approached Dorset County Council over the possibility of the authority taking ownership and future responsibility for the bridge. 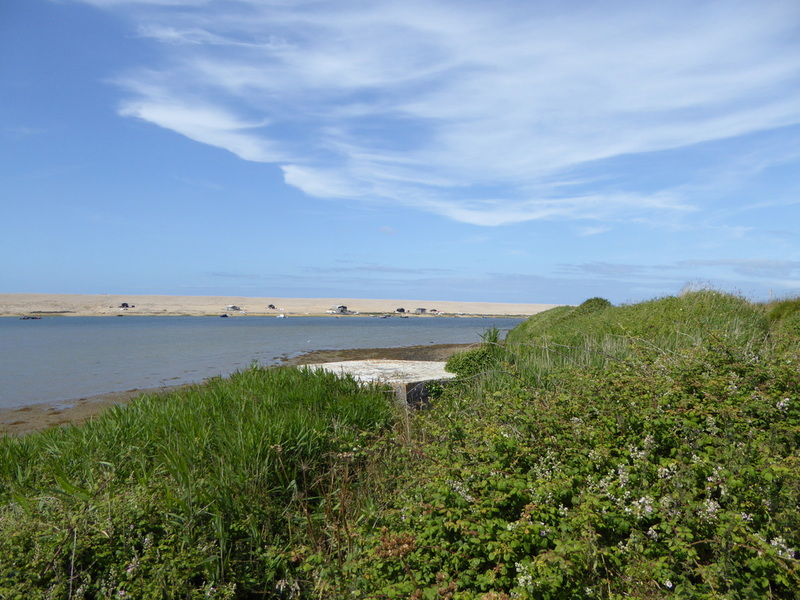 Negotiations followed and despite lengthy disagreements over terms, the Ferry Bridge Commissioners, Ferry Bridge Committee and County Council later reached an agreement in 1894. All tolls for use of the bridge were abolished on 2 August 1894. In accordance with the agreement between the three parties, the County Council soon began constructing a replacement, based on Coode's designs. Work commenced in November, while a temporary bridge was also erected to maintain a connection between Portland and the mainland. 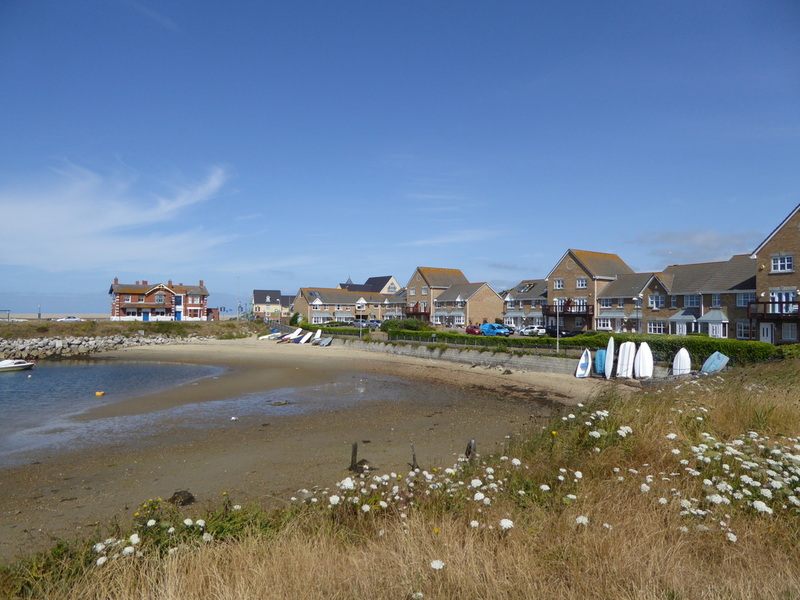 The Bridge Committee contributed £3,000 towards the costs, while the funds of the Bridge Commissioners, amounting to over £6,000, was transferred to the council. The first half of the bridge opened to traffic on 12 September 1895 and the rest was completed and opened on 2 March 1896. By the 1970s, the iron bridge had also fallen into a state of disrepair, suffering from various structural issues including extensive rusting and signs of subsidence. In addition, the bridge was considered increasingly unsuitable for handling the amount and weight of modern vehicles. 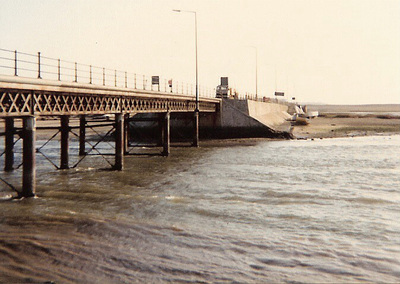 Dorset County Council authorised an assessment of the existing bridge in 1979, which was carried out by Rendel, Palmer and Tritton. It was concluded from the findings that a replacement was necessary. 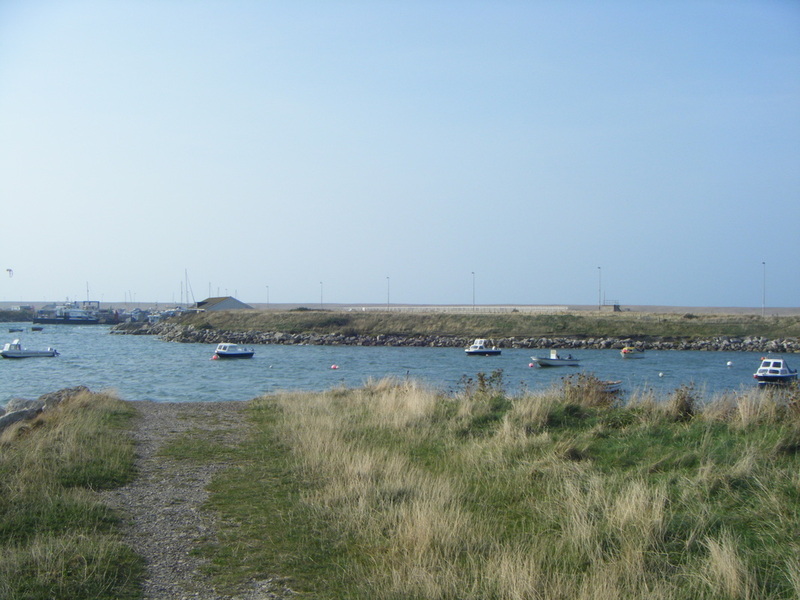 Plans were soon drawn up for a £2 million scheme which involved the construction of a replacement bridge, some land reclamation work and the upgrading of the existing roadway leading to the bridge. The bridge itself was positioned 180 metres south of the original's position. 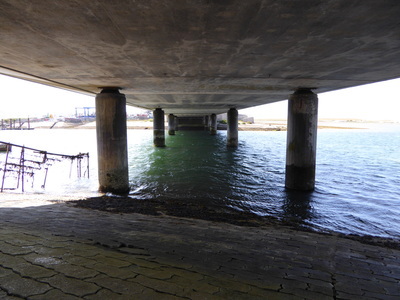 As the original channel between Portland Harbour and the Fleet was to be closed, a new channel was formed underneath the new bridge to maintain the tidal flow to the Fleet. 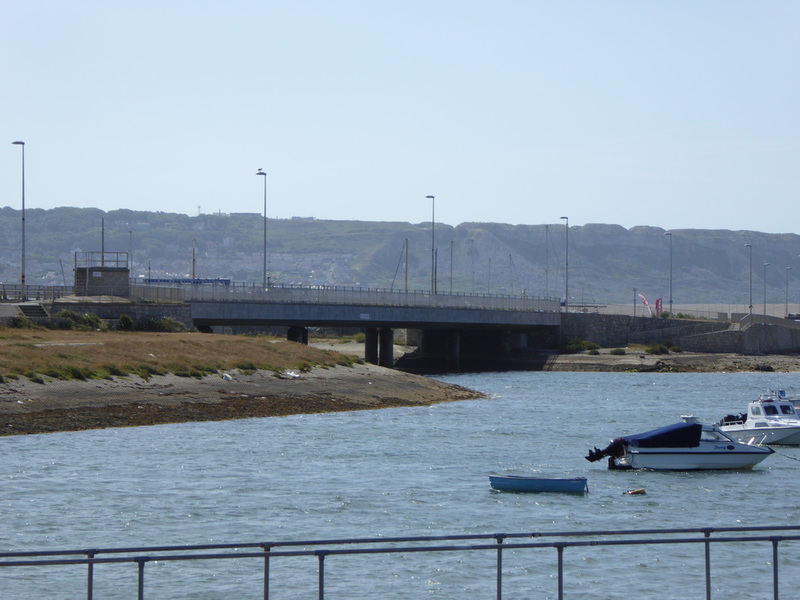 The contractors, Davies Middleton & Davies Ltd, began work in 1983, with the new bridge being largely built of Portland stone and completed in 1985. 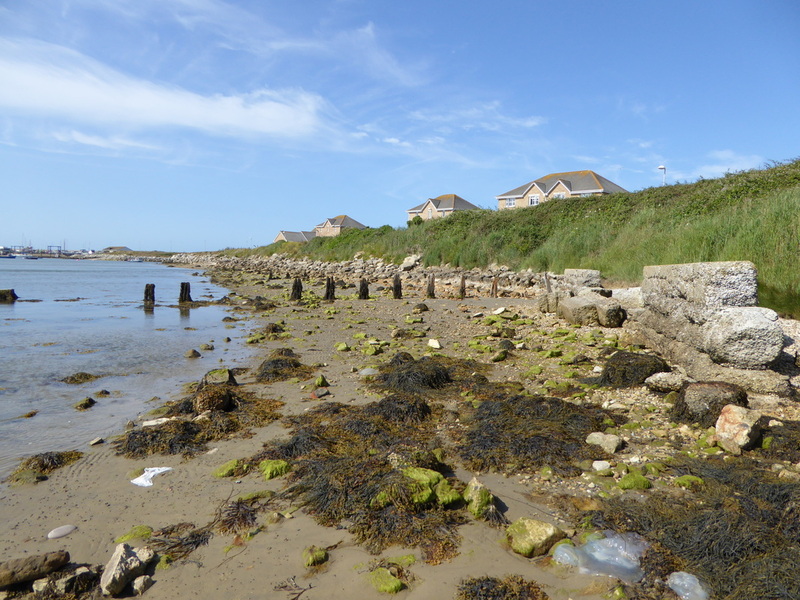 In addition to the road bridge, a 198 yard wooden viaduct was erected across the Smallmouth passage in 1863-64 to serve the Weymouth to Portland Railway, which opened to traffic in 1865. The viaduct was later replaced with a steel one in 1902, erected by Messrs George Palmer and Company of Neath. It was demolished in December 1971, following the closure of the line to passengers in 1952 and goods traffic in 1965. As per the requests of the Admiralty for a torpedo factory to be established in Britain, Robert Whitehead, the engineer famous for the development of the first effective self-propelled naval torpedo, established his Torpedo Works at Wyke Regis in 1891 for the manufacturing of torpedoes. Built by Messrs Hill & Company of Gosport, it was located close to Ferry Bridge on the northern side of Portland Harbour, where torpedo testing and practice firing was regularly undertaken using a purpose-built 1,060 yard pier projecting into the harbour. Following Whitehead's death in 1905, Armstrong-Whitworth and Vickers Company took over the factory, which continued to thrive as Wyke Regis' key employer. 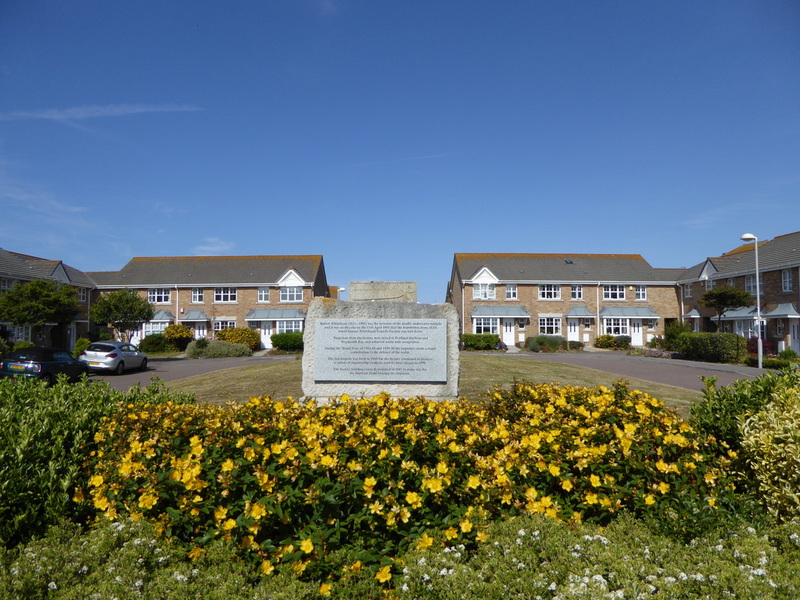 Prior to the outbreak of World War II, over 1,500 workers were employed at the factory and much housing in Wyke Regis had been constructed for them. The factory was later sold to Wellworthy Ltd in 1967 and eventually closed in 1997. 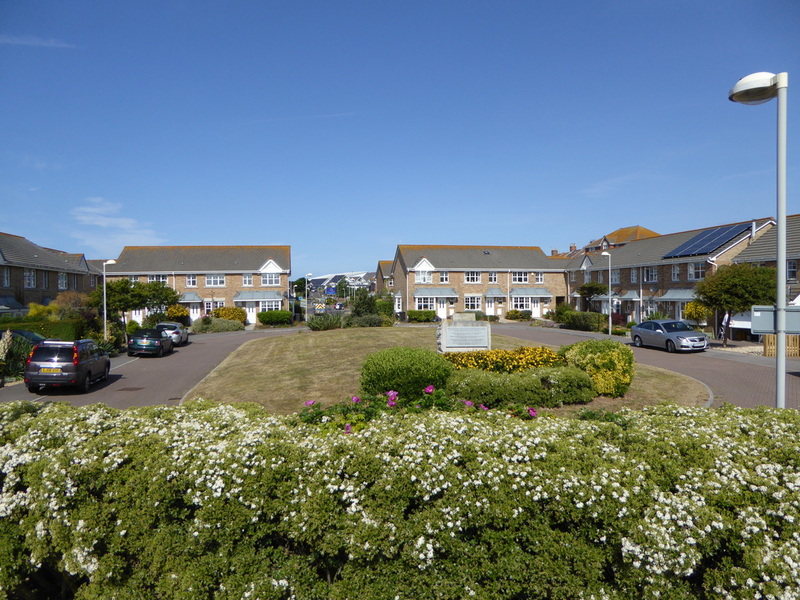 That same year saw permission granted for Crest Homes Ltd to demolish the site and transform the area into a large housing estate. The factory's foundation stone, along with a commemorative stone can be found within the estate. 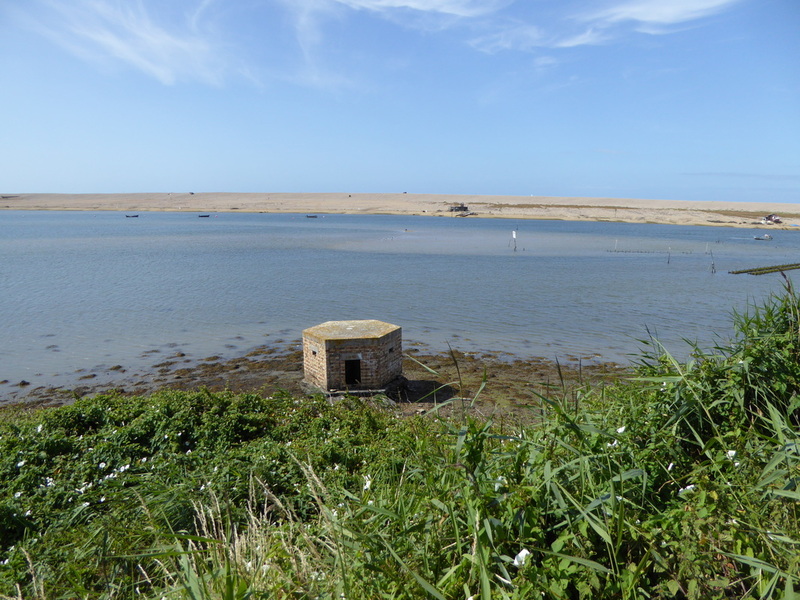 In 1880, the Weymouth Port Sanitary Authority opened an infectious diseases/isolation hospital a short distance north of Ferry Bridge, on the western side of Wyke Regis, overlooking the Fleet. 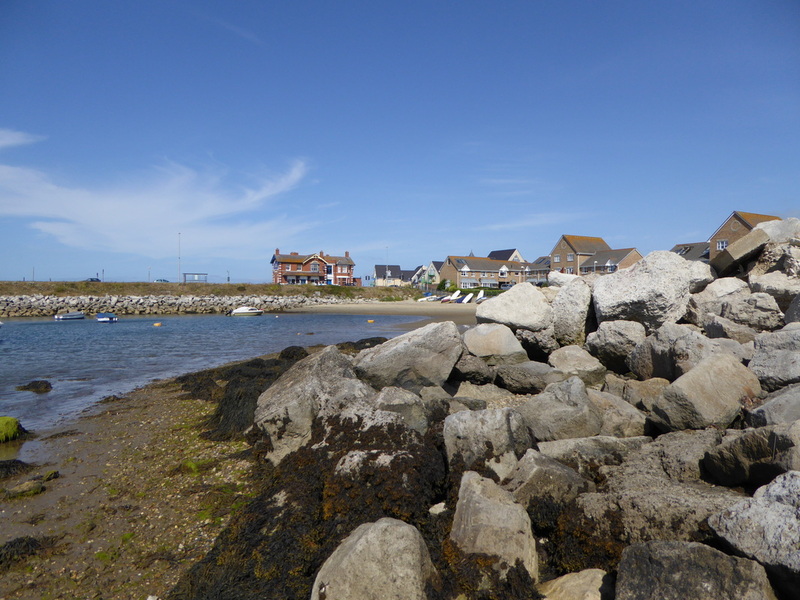 The authority was established in 1877 and permanently constituted in 1897, acting as the health authority for both Weymouth and Portland Harbours, as well as others along the surrounding coast. 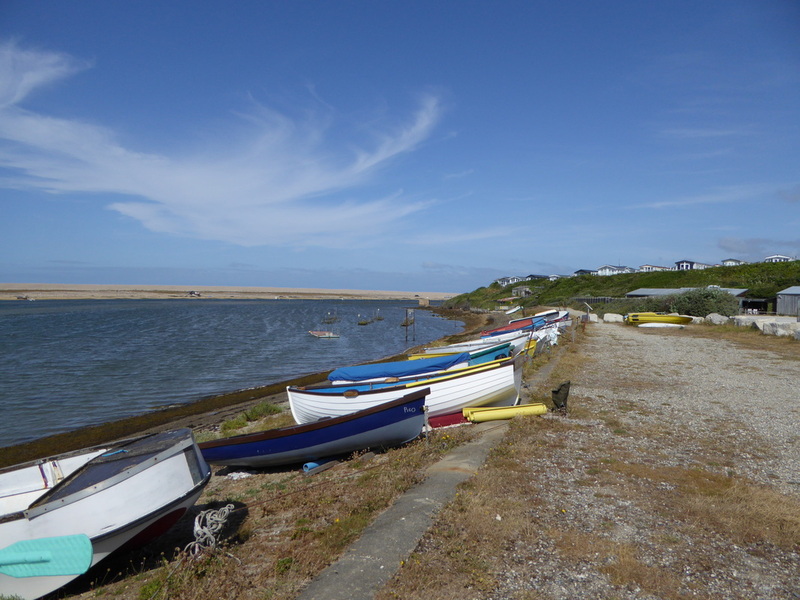 The authority would carry out inspections on vessels arriving at local ports and harbours, with the control of infectious diseases being a primary focus. Plans for the isolation hospital were drawn up by the local architect Mr George R. Crickmay and tenders for its construction were sought in February 1879. The tender of Messrs Bull and Son of Southampton was selected for £4,047, and the four-ward hospital was opened in October 1880 for sick and quarantined seamen. Following its closure in 1933, the hospital was sold by auctioneers Messrs Henry Duke & Son in 1937. The site went on to become the Chesil Beach Holiday Camp, later known as the Blue Waters Holiday Village, Chesil Beach Holiday Park and currently as the Chesil Vista Holiday Park. 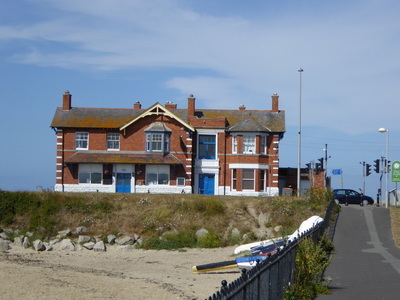 The former ward buildings survive and are now in use as holiday apartments and on-site facilities for guests. 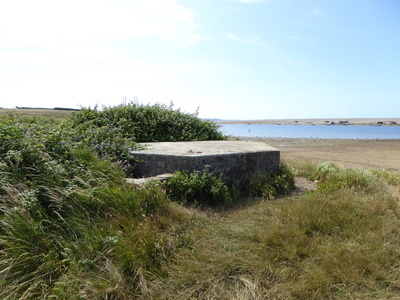 Close to the bridge and west of Portland Beach Road is a World War II pillbox of Type 22 design, overlooking the Fleet Lagoon. 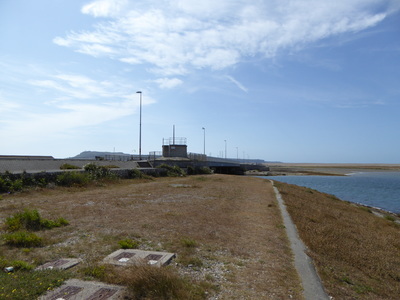 It was constructed sometime during 1940 as part of British anti-invasion preparations, at a time when the German's invasion plan, Operation Sea Lion, was considered a major threat. It is hexagonal in plan and constructed of brick and reinforced concrete. 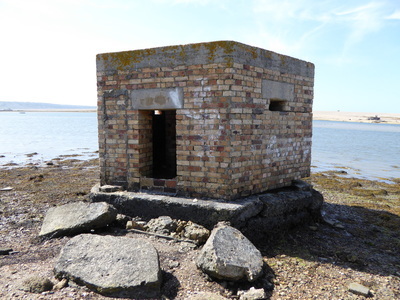 The pillbox still survives today although the external blast wall has collapsed. Further pillboxes, among other anti-invasion measures, were placed along the lagoon, some of which can still be seen today. The view of Ferry Bridge from the west, looking across at the bridge itself that links Portland to the mainland. A closer view of the bridge from this position. The underneath of the bridge. 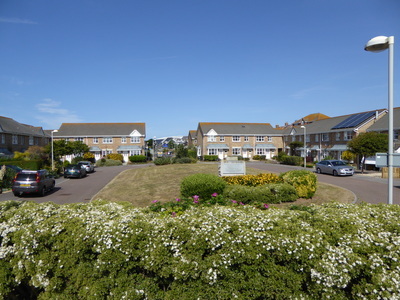 On the Wyke Regis side of Ferry Bridge is this housing estate, which was once the site of Robert Whitehead's Torpedo Works. 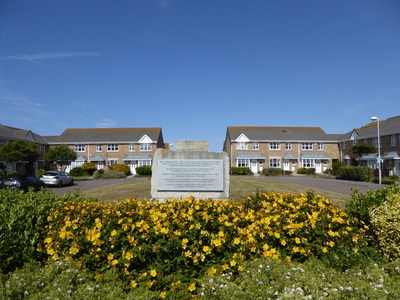 When it was demolished in 1997, and turned into a housing estate, a memorial stone was laid down. This can be seen in the centre of the photograph here. 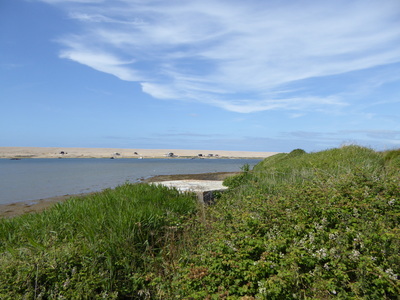 Ferry Bridge, and this part of Chesil Beach, from further along the coastline which runs alongside the Rodwell Trail. The wooden stands seen here are the remains of the Whitehead Factory Torpedo Pier. Further away from Ferry Bridge are the remains of a World War II pillbox which would have defended the northern side of Portland Harbour. From this point the railway viaduct would once connect from one side of the Smallmouth passage to the other. 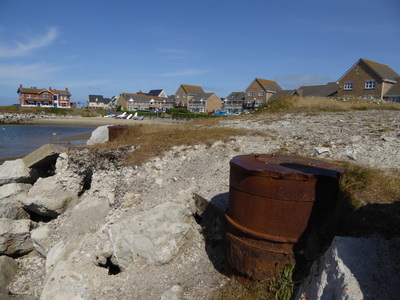 When it was demolished in 1971, two rusted metal stumps of the original supports were left behind. Smallmouth Beach is found on this side of Ferry Bridge. The Ferry Bridge Inn is found along the roadside. The beginning of the Rodwell Trail follows down this path, with the inn seen in the distance. 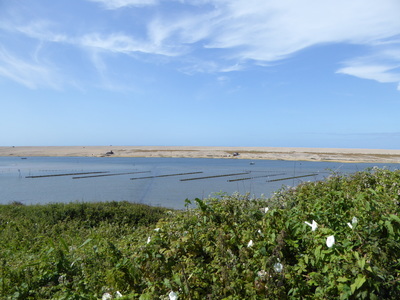 The view across the Fleet Lagoon from the bridge. The Ferry Bridge Inn, seen here in October 2016, closed and awaiting demolition. 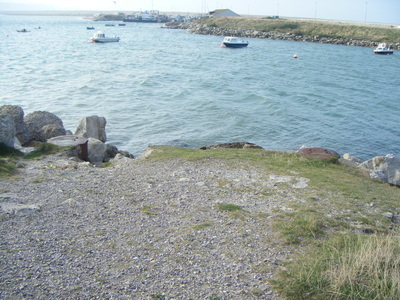 Within this area, west of the bridge, is a small slipway area, and a World War II pillbox - seen in the distance here. 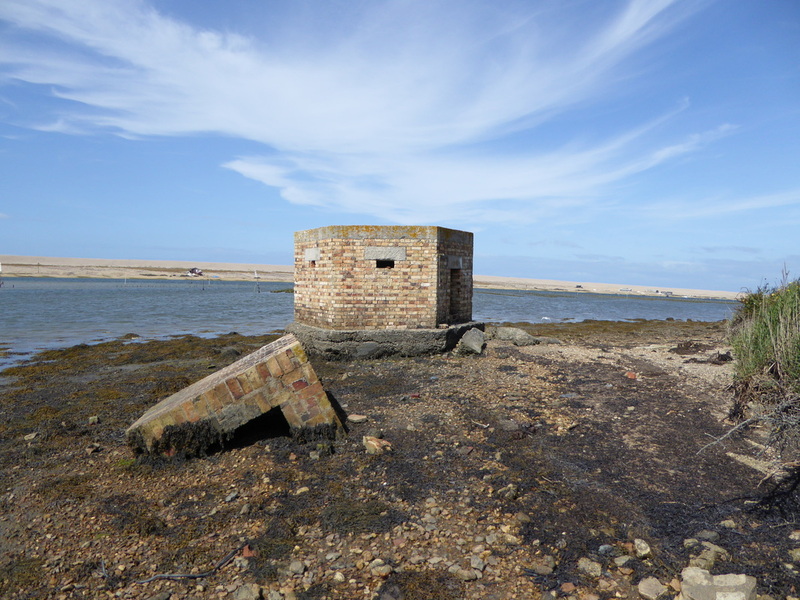 The pillbox at low tide, with its now separated external blast wall. 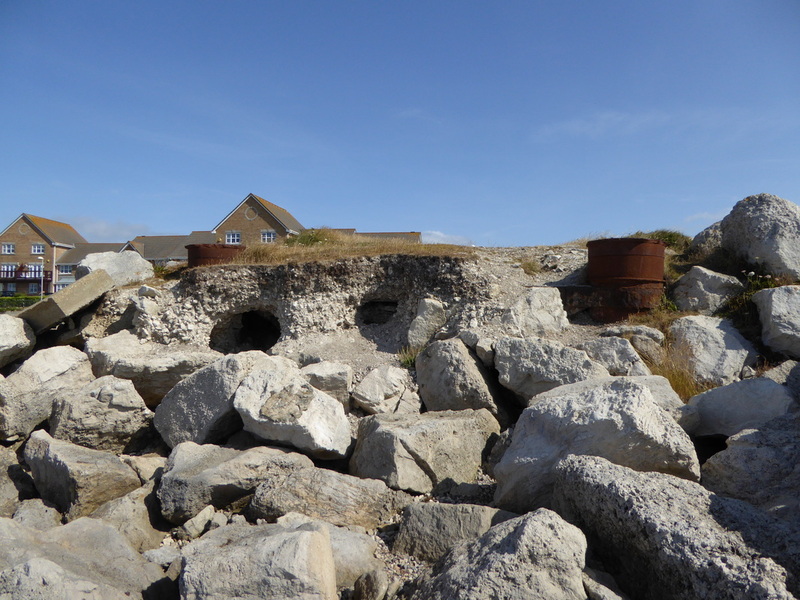 Although the structure remains in a good condition overall, the sea is taking its toll on the pillbox. 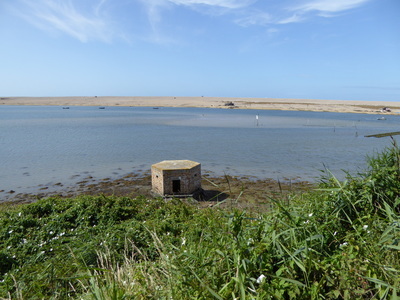 The pillbox as seen from a public footpath extending above the Fleet. This region is used as an Oyster Farm. 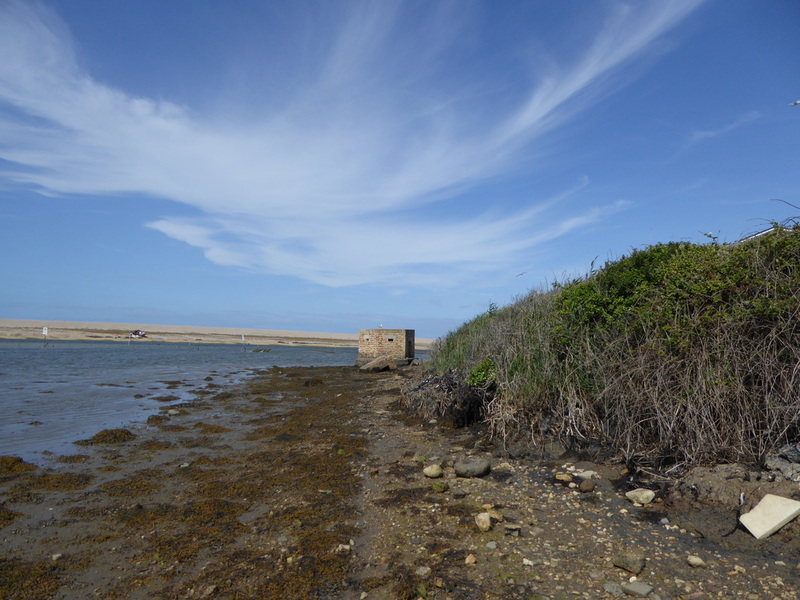 Further along this path, heading away from Ferry Bridge, another pillbox was placed to defend the Fleet. And another even further along the path.